Costa Caramel Latte. Authentic Costa Coffee taste. Indulgent & silky smooth. Sweet, buttery caramel flavour.A specially crafted blend of coffee beans roasted to perfection to create the same authentic taste of a Costa espresso based Caramel Latte. The indulgent silky smooth taste, with a sweet, buttery caramel flavour, creating the perfect treat. Exclusively for the TASSIMO system. Since it's ground from Rainforest Alliance Certified? coffee beans, every cup helps coffee farming communities build a better future and protect the environment. 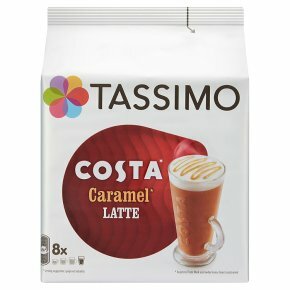 Explore the rest of the Tassimo Costa range and indulge in more of your coffee shop favourites. From a Tassimo Costa Cappuccino to your everyday Tassimo Costa Americano.